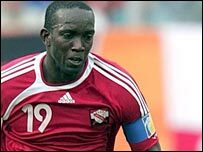 Sunderland's Trinidad & Tobago striker Dwight Yorke has retired from international football. Yorke, 35, played at the 2006 World Cup and has 59 official caps, but has decided to concentrate on the Black Cats' Premiership promotion campaign. The former Soca Warriors skipper said: "The time is now right for me to concentrate on my career at Sunderland. "It's been a great personal and professional honour to play and captain Trinidad and Tobago over the years." Yorke has formally written to Jack Warner, special advisor to the Trinidad & Tobago Football Federation, to notify him of his decision. The former Manchester United player initially retired from international football in 2001 after a dispute with the team's management. But he returned for the 2006 World Cup qualifying campaign, the Soca Warriors securing their qualification with victory over Bahrain. "I would like to thank all my fellow team-mates from Trinidad and Tobago who have given me such support and our fantastic fans who are unique in the world," added Yorke. Yorke joined Sunderland from Australian side Sydney FC in August and has scored four goals in 27 appearances for Roy Keane's team. Sunderland are currently fourth in the Championship table, six points behind leaders Derby. Yorke started his career in England when he signed for Aston Villa in 1989. He left Villa for Manchester United and played for Blackburn and Birmingham before leaving for Sydney.